/ FAQ / FAQs / Why is my CF7 Skins Style not applied to my form? For CF7 Skins and any additional add-ons to work, you need to select a CF7 Skins Style and save it. 1. Edit your contact form and scroll down until you see the Skins section. Here, there are the Form, Template, and Style tabs. 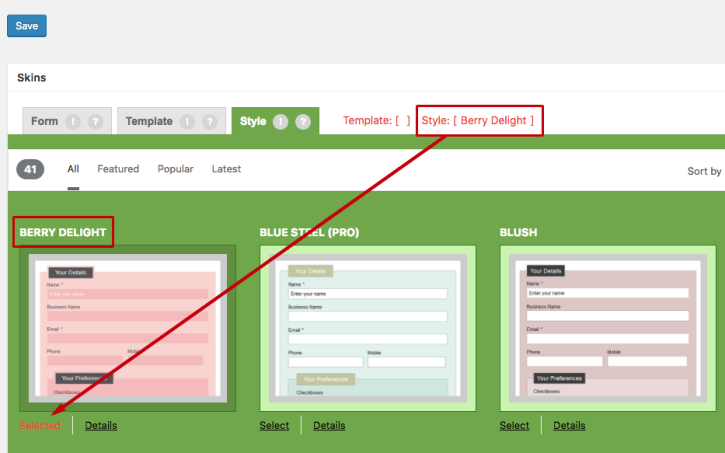 Tip: If you have a Template or Style already selected, the names will appear in the red [ ] brackets. 2. Click the Style tab. 3. Click Select below the image to choose a Style. The style will now show as Selected and Style:[ ] will have the Style name you chose. 4. To change the Style, click Select on your new choice. It will override your previous Style selection. It is also the minimum Style needed to support our CF7 Skins add-ons: Multi, Ready, and Logic. 5. 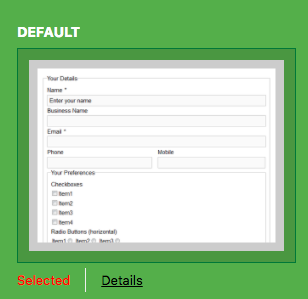 Once you have selected a style, click Save If you do not save your changes, your new style will not be applied to your form. Tip: You only have to click one save button, not all of them. To update the Style or Template, you can click any Save button. To update the Form tab visual editor, you must click the Save Visual button. In the example image above, the red text Style: [ Default ] is to show your chosen style without having to go back to the Styles tab. Template: [ ] has no name because a Template has not been selected.